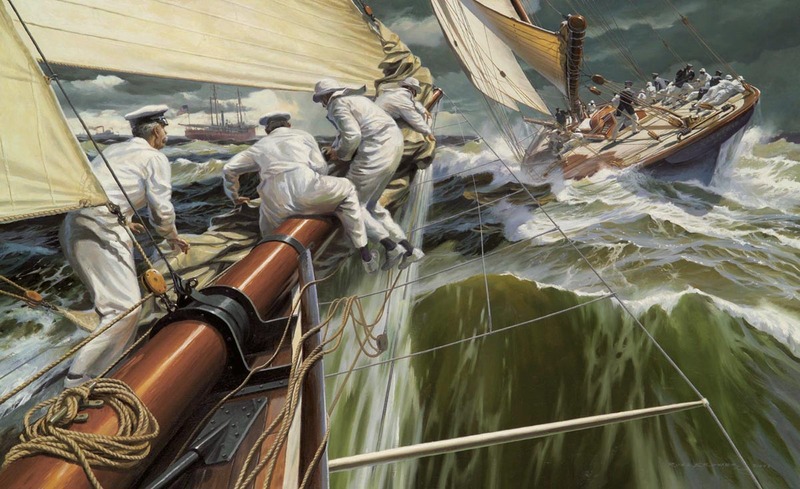 Oil on Canvas, 27" x 43"
Crew aboard VIGILANT drop a jib topsail as the skies darken at the start of the third race of the America's Cup defense, Friday the 13th of October, 1893. Though ahead throughout, challenger VALKYRIE II would find bad luck on the stormy run home, losing her enormous spinnaker, handing a close victory to VIGILANT. Russ Kramer writes: �I love this era of the great cutters that vied for the cup around the turn of the century. Reference photos are hard to come by, but I was able to recreate accurately the bowsprit details aboard VIGILANT from the original blueprints, thanks to the wonderful Herreshoff Museum in Bristol, RI. This painting is in private collection.